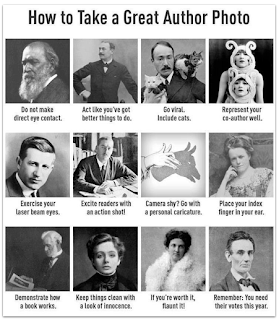 What Makes a Good Author Photo? When building your author brand it's important to have a good author photo. People want to see the face behind the book. They want to feel like they know you. Having a good author photo is a good starting point. But what makes a good author photo? I came across this guide on how to take a great author photo and, once I'd stopped laughing, it made me think about what works and what doesn't. Whilst I appreciate that some people prefer not to put their own face everywhere (there are numerous reasons why people decide to stay in the shade) I always feel a bit disappointed though when all I get is an avatar or caricature instead of a real person. Another clear lesson here is that if you decide to use accessories in your photo you need to choose wisely. The "writer at work" pose isn't bad in itself but it needs to look natural. Although animals are very cute the main subject of the photo should be you. Is a character in your book based on your cat? If not should he really be in your author photo? How old is your photo? Although you may have been more of a looker in your younger years can you still honestly say that your photo is current? Author photo's should be updated at least on a yearly basis. If your bio reads that you started writing full time when you retired having an author photo of you as a twenty-something might seem a bit odd. screen shot of Google results for "author photos"
One of the first things I noticed was that most of the photo's were in black and white. Does this mean it's the "norm"? If the answer is yes, maybe it's not a bad thing to go against the trend as the colour photo's stand out a lot more in the mass. Other things I noticed were that the majority make eye contact and that most of them feature just a close up head shot. This is a photo I took of myself this morning (I used the timer setting on my camera to delay the snapshot by 10 seconds to give me time to get in front for the picture). As you can see I then edited the photo to make it black and white. 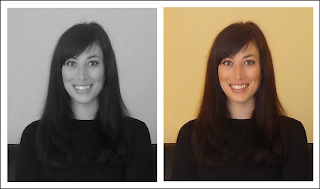 Which photo would work best as an author photo? Does it make a difference if the photo is for use online or for print? I've still got to find the answers to a lot of questions on this topic but my research has definitely given me food for thought. What are your thoughts about author photo's? Is yours black and white or in colour? Did you get it professionally taken or D.I.Y.? What, for you, makes a good author photo? Have your say in the comments section and feel free to post the link to your own author photo. I do my own... when I first started writing I had a professional photographer do mine. I've taken some photography classes, so while I may not be a professional I do know how to light up the 'stage', how to set the camera to take the best quality picture, and how to prevent those unflattering shadows. I prefer in color photographs when possible. I also prefer some sort of background, as it looks as if you are more 'real'. I got this idea from looking at Brian Jacques' books. While his author photos ARE in black and white they are always set against a place where he might go walking while working out a story. Head shots are the best, in my opinion, as they allow your reader to view you up close as if they were talking to you. I agree that it's not necessary to hire a professional photographer but only if you can take a good photo yourself. Lighting is a big issue when it comes to getting a quality pic. Knowing your best angles helps too. I personally love black and white photo's in general. I'm not really sure what it is about them but I've always liked them. That said sometimes the colours in a photo really add to the end result. Colour can also make it seem more like the real person in front of you too. You can always edit your photo and crop it into a head shot. Even a program like "paint" can be used to do it. Jo, looking at the photos I do like the color one better. If you go with the b&w one it should be tweaked a bit as the conversion has resulted in an image that on screen looks to be underexposed and slightly flat. I would brighten it and increase the contrast in the b&w. Even in color brighter and higher contrast will jump off the page better in smaller images in my untrained opinion. Thanks for stopping by Edward. The black and white one does look flatter. I guess that's one of the reasons colour photo's make you feel like it's the real person more. I haven't edited either picture yet (other than doing a B/W convert on it). For print I'd definitely tweak them though.